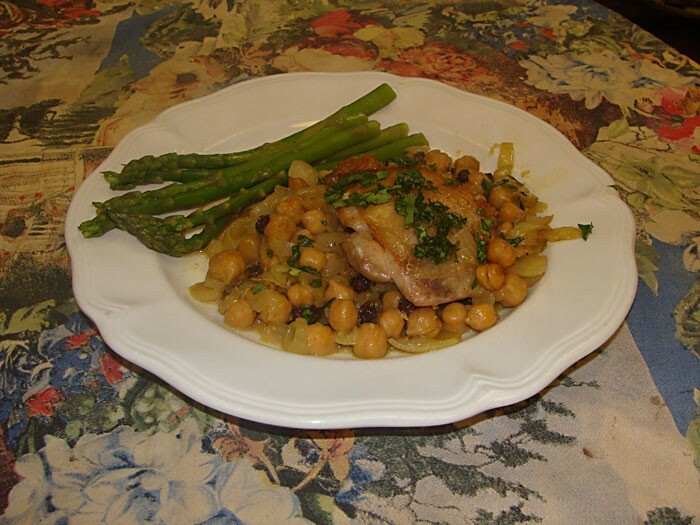 Georgian Chicken Thighs With Chickpeas. Photo by Darius Brotman. God, this is a good dish. I know I should lead in with a catchy hook about its antioxidant flavinoids, or its localvore superiority, or its ability to increase your prowess in between the sheets. Yeah, I'm getting to that. But really, this dish is just awesomely delicious. It originates back in my poverty-stricken days as a young museum-education employee aspirant with big dreams of leading school groups and making a living wage. Long-time readers may recall my column of a year or two back, entitled "Cheap Eats," where I chronicled some of my efforts at making a good meal out of cheap stuff. I didn't mention it at the time, but part of that project was a projected cookbook about chicken and potatoes. By the eighth or ninth meal of said two ingredients, even my starving friends were begging me to incorporate something else. After kicking my rude friends to the curb, I considered. What price chickpeas, I thought. Answer: cheap. And so, my long, slogging saga of chicken and chickpea dishes began. Some of you recall my 'Manly Chicken and Chickpeas' recipe from "Cheap Eats," and here is a Chicken and Chickpea recipe I think is even better. And so cheap!!! SO CHEAP. How cheap? Dinner for four for under $10, yo! And that's with organic chicken! Assuming you have no standards, you could cut it to $6! I admit I cheat somewhat by assuming you have a constant supply of basic spices, olive oil, currants, onions and garlic. You do, don't you? What kind of cook are you? Actually I am out of currants right now, but I usually have ’em by the bucket. I swear. If by some chance you airily shop with no thought of price, I have another reason chicken and chickpea dishes are my greatest gift to mankind. (Okay, God's gift to mankind, are you happy now?). They are easily made with ingredients most cooks have about the house, i.e., canned chickpeas, chicken parts and spices. No shopping, or at least very little shopping! Some days you just don't want to see everyone you know at the grocery store. You also need a largish cast-iron skillet, 10 inches or so. Oh, that's another great thing; it's a one-pot meal! Very Betty Crocker in this era of comfort food. Is that still happening? Well, fewer dishes to wash works for me. I am a real miser with the dish soap. But I digress; after the earthquaky month we've had, I was reminded of how important it is to have in my repertoire a series of dishes that can be made with foods we almost always have on hand. I mean, you can just open a can of hash, but really, by day three of Wildberries being closed, won't you want to stop adding insult to injury and feed yourself something based less on potato starch and old beef? And if you think you recall Chef Boy-Ar-Dee Raviolis as delicious, lemme tell you, things have changed a lot since you were 7. Having recipes on hand that are easily made out of what you probably have is always a good idea. 1. Preheat a large, very lightly oiled cast iron pan over a medium-high flame. Sprinkle a little salt and pepper on the skin side of the chicken thighs. Place them carefully in the hot pan, skin side down, so they are only at most barely touching each other and the pan's sides. Be careful as they may spatter. Leave thighs without moving for 3 minutes, then, using a spatula, carefully check the skin. The goal is to get the skin crispy without cooking the flesh. It should take anywhere from 4 to 6 minutes to get nicely tan and crispy looking. The side of the thighs facing you should still be pink, with the very edges only of the meat beginning to turn opaque. Remove thighs from pan and set aside. Pour off all but 2 tablespoons, roughly, of the rendered chicken fat. Lower the heat to low to cool the pan, and add the chopped onion. The onion will sizzle loudly. Stir rapidly. As the temperature of the pan cools and the sizzle desists, turn heat up to medium. Slowly cook the onions, stirring, until they turn the color of a caffe latte -- a nice tan. Watch carefully to prevent scorching. Caramelizing onions like this is easy, just keep stirring and don't walk away from the pan. It should take about 12 minutes. Turn the heat up to high. Add chick peas then, except for the chicken and garnish, stir in all other ingredients in the order listed. Keeping stirring for 1 minute. Turn off heat, and gently place chicken thighs skin side up on top of chickpea mixture. Cover cast iron pan with oven proof lid, and bake in preheated oven for 20 minutes. Let sit covered for 5 minutes before serving. If wished, sprinkle with cilantro garnish once plated. Brussel sprouts lightly steamed and tossed with black pepper and lemon juice are an excellent pairing.